These supreme Moku pre-finished engineered oak floorboards are Real European Oak. The boards are 20mm thick, super long and super wide - highly popular with architects and premium dwellings. Superior strength, density, and rigidity enables a quick installation over any flat, sound subfloor - and whats more? You can walk on them immediately! The KIMI presents a raw and rustic chocolate colour with deep hints of charcoal grain. The clean, satin finish enables the sense of nature to be right under your feet whilst still providing a smooth surface underfoot. You do not need to pay $180+/sqm in reseller showrooms - we do not charge retail margins. KIMI French Grey Oak - Luxurious, Everlasting, Graceful. Engineered Oak hardwood floor boards are the most sought after timber flooring by architects and discerning home-owners as they are stronger and wider than normal floor boards, are pre-finished for easy installation, and still boast the beauty of real French Oak. Moku™ Grand European Oak floor boards boast 220cm lengths and 22cm widths in a UV protected satin finish. Moku's 20mm engineered oak floorboard range is supplied by GrandOak, a leading Australian floorboard manufacturer, who offers the same range under their "GrandOak Monarch" series. That means you get the benefit of local supply, support and a lifetime Australian warranty, at a highly competitive price by avoiding showroom margins. European Oak (also known as "French Oak") is a high density timber providing superior strength and wear properties. It can be cut accurately, drilled and glued making it easier to work with. See this article on Why Engineered European Oak flooring? Engineered floating floor - base layers are cross layered and glued plywood plantation timbers. KIMI presents a raw and rustic chocolate colour with deep hints of charcoal grain. The clean, satin finish enables the sense of nature to be right under your feet whilst still providing a smooth surface underfoot. As a natural product there will be a variety of natural features as expected from hardwood. What coverage do you need? Calculate the floor surface area required in square metres. Include doorways and stairways. Add up to 10% as a buffer for wastage and to allow you to stagger board lengths efficiently. Do you want underlay? Laying premium underlay can provide important benefits: subfloor protection, smooth out minor sub-floor imperfections, tread cushioning, moisture barrier, and acoustic abatement. Need stair bull noses? Architecturally designed solid oak stair nosing is your best choice - available in all the Moku finishes. This is only available to be purchased with a floor board order. See more details here. Need scotia (edging/moulding)? Use scotia edging trims to cover perimeter expansion gaps along skirting boards, walls, kitchen kickboards and cabinets. Available in all the Moku finishes. See more details here. 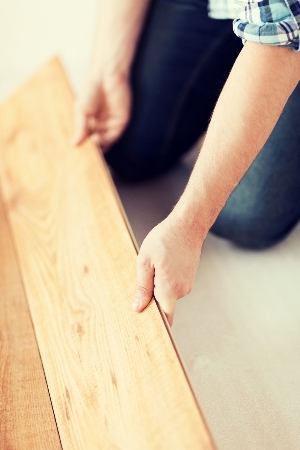 Installation of these floorboards is easier than you think. They can be installed as a floating floor over suitable underlay, or installed using the direct stick (glued down) method. Preparation and having the right tools is the key. The tongue and groove system ensures your floor boards are accurately installed. We recommend joins are glued with a flexible premium hardwood PVA adhesive. 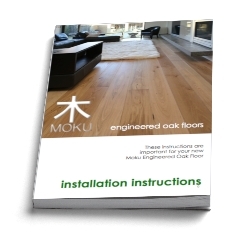 Download the Moku Floorboard Installation Instructions - they are important to ensure your floating floor is installed properly and covered fully by the warranty. European Oak is very resilient to wear, but it's important to understand the simple maintenance procedures that will ensure your new floor stays looking beautiful. 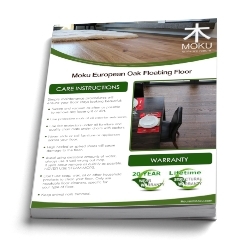 Download the Moku Oak Floorboard Care Brochure to understand how to keep it in pristine condition for years to come. Moku floorboards are protected by an industry leading comprehensive supplier warranty that provides 20 years protection on surface wear under normal use and lifetime structural protection for any structural defects such as delamination, cracking, warping or twisting - or any structural deformations at the time of supply. Installation instructions must be adhered to and terms and conditions apply.